The gangs involved in fake currency trade have become active in producing and circulating those across the country to cash the large-scale cash transaction in the cattle markets ahead of the Eid-ul-Azha. 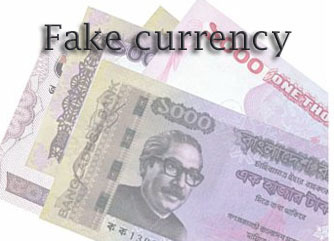 “We have been put on alert against production and circulation of fake currency ahead of the Eid-ul-Azha,” additional deputy commissioner (media) Obaidur Rahman of Dhaka Metropolitan Police (DMP) told BSS today. “As part of the intensified intelligence surveillance to check production, circulation and use of fake currencies, Detective Branch (DB) of police arrested four people along with fake local currencies worth Taka 32 lakh from Kalyanpur under Mirpur Model police Station on July 19,” he also said. During preliminary interrogation, the arrestees, Jasim Mandol, 30, Abdul Jalil, 28, Sagar alias Ripon Das, 30, and Jalal Uddin, 28, confessed that they were producing fake notes targeting the cattle markets. A case was lodged to this end with the respective police station. Police Headquarters has asked all the concerned authorities to take necessary measures including stepping up intelligence surveillance across the country to prevent production and circulation of fake currencies. As per directives of the police headquarters, intelligence vigilance coinciding with crackdowns has been strengthened across the country to stop circulation of fake currency particularly in the capital city. The law enforcers are now collecting information relating to the fake currency making syndicates. Law enforcers have been asked to conduct special drives after identifying the places where the counterfeit bank notes are being produced and used. Intelligence watch has been intensified at different places, particularly at shopping malls and bank areas as the currency forgers usually increase production of counterfeit notes targeting the Eid. In addition to the shopping malls and bank areas, places around different slums are also under watch because the currency forgers prefer illiterate slum dwellers for circulating the fake notes. Over 30 syndicates have been involved in producing different fake currencies, especially US dollars, Euro, Pound, Saudi Riyal and Taka, a police official said. “Criminals usually choose the low grade areas like slums located at different parts of Dhaka, Narayanganj, Savar, Tongi, Gazipur, Munsiganj and Keraniganj for running the illegal business,” he said. “The criminals spend around Taka 150 for producing a note of Taka 500,” he said, quoting some of the criminals earlier arrested and interrogated by law enforcers. “The fake note traders first sell a fake note of Taka 500 at Taka 250 to the whole sellers who sell it to the third party at Taka 350 who later sell it to the fourth party at Taka 400,” he said. “Though we have lodged scores of cases against the arrested people with different police stations, they usually get bail from the court after a period as the sections of law under which the cases were lodged are bailable and later they get involved again in the same business,” he added.